Blog - A Monumental Vault Find! With silver prices dropping almost $1 per oz over the last week, our readers have been looking for the best silver deal to take advantage of the drop. We dug deep into the vault to find a special silver offer that would be perfect for our readers. I believe we found one of the best deals in the marketplace, for a low price not often seen in the silver market! Johnson Matthey is one of the most prestigious names in bullion. The company, founded in 1817, was a major producer of silver bars until its refining division was sold in 2015. Since then,Johnson Matthey branded bullion items have become highly desirable with both investors and collectors. When groups of their bars come available -- which doesn't happen often -- they're spoken for quickly! 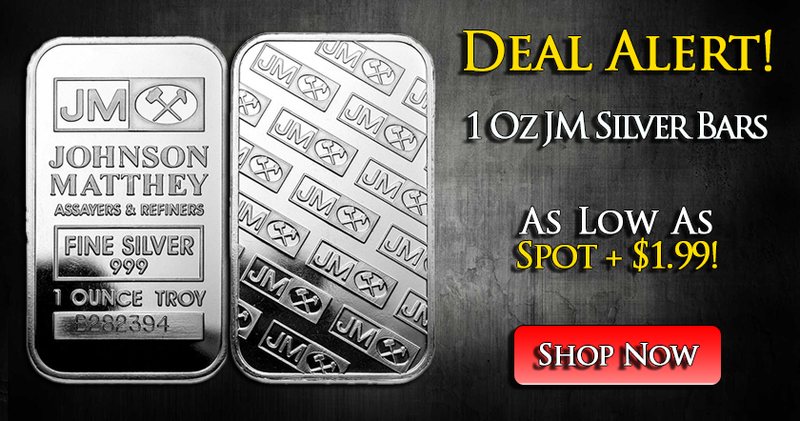 This week, we were lucky enough to find a group ofJohnson Matthey one ounce silver bars stashed away in a depository. We've been looking for a group of these for over a year, but our wish was finally granted! Ever better: we scooped these up a very favorable rate -- and are offering you the bars at the industry's best prices. Other dealers are quoting a $3.50-$5.00 premium, but your cost is as low as $1.99 over spot! This is, to our knowledge, the lowest price of any major dealer by far! The only downside: we only have a limited number of these bars. 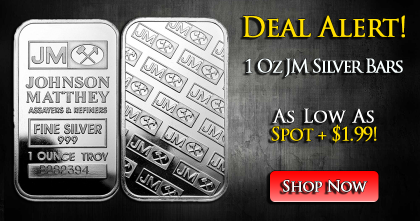 Since JM bars are out of production, available quantities are strictly limited to what we have on hand. If you're interested in adding some of these collectible and hard-to-find bars to your holdings, we encourage you to act quickly!